Note: Due to the length of the topic, this will be a multi-part post. An iconic photograph of a bearded Abraham Lincoln showing his head and shoulders. Back in June, a friend of mine said “I really think it's time for the Democrats to reclaim Lincoln from the Republican Party.” It was quickly pointed out that Lincoln was indeed a Republican , which is factually correct, but ignores the differences in the politics and policies of the Republican Party of the 1860s and the Republican Party of the 2010s. When looking at political parties of any era, especially when comparing parties of said eras, it is important to take into account the political realities of the time, the stances of the parties, the viewpoints of the members of the parties, and what the parties were voting for. For example, in my blog post about Minnesota’s voting history, I brought up that Minnesota overwhelmingly voted Progressive (Bull-Moose) in 1912 , while the Republicans had the majority in 1972  and the Democrats in 2012  - in each case, the candidate who won Minnesota happened to be the more progressive candidate. The same goes for Lincoln. Depending on one’s point of view, the United States is currently either in the Fifth or Sixth Party System [Note 1][Note 2], however, Lincoln and the Republican Party of his era were in the Third Party System. As the Second Party System came to a close, the Whig Party was collapsing - slavery was a major issue that split the party. In the northeast, Whigs cared about national unity but didn’t care about slavery. In the north, Whigs thought that slavery was incompatible with the (then) modern economy. In the south, Whigs supported a strong textile industry and often found themselves aligned with the northeast as well as supported a stronger fugitive slave law. Anti-slavery Whigs and some Free-Soil Democrats joined together to fight the Kansas-Nebraska Act (the act that opened Kansas and Nebraska territories to slavery, repealing the Missouri Compromise)  [Note 3]. Eventually, the South attempted to secede from the Union, the Civil War was fought with a Union Victory, and the Civil Rights Act of 1866 was passed . This was the period of the Republicans being the progressive party [Note 4]. Like the Whigs before them, the Republican Party had factions: Radical Republicans , who wanted Blacks to have the same freedoms as Whites and to have harsh punishments for rebels; Moderate Republicans (with Lincoln as their leader), who wanted to reintegrate the Confederate States back into the Union as quickly as possible, and the Conservative Republicans who opposed the Radical Republicans. Enter the Fourth Party System. After Reconstruction happened in the south, Republican power waned as Democrats reasserted themselves in the Solid South. Great wealth has come to the North because the Republican leaders had become plutocrats - high tariffs and high spending, which did not help the southern plantations but was a boon for northern industries. Also, the Panic of 1893 [Note 5] led to a major Republican victory in the elections, which restored the confidence of businesses. The Republicans were seen as the friend of business, while still holding the mantle of being the progressive party. But this also caused friction within the party, as progressive members became concerned that party leaders and businesses were getting too comfortable with each other. Note 1: To quote Wikipedia, “a party system is a concept in comparative political science concerning the system of government by political parties in a democratic country. The idea is that political parties have basic similarities: they control the government, have a stable base of mass popular support, and create internal mechanisms for controlling funding, information and nominations”  - that is to say, how many relevant parties there are, how fragmented they are, and how effective each party is defines a party system. Note 2: The contention between whether we are in the Fifth or Sixth Party System comes from whether or not one sees the Civil Rights Era and the Reagan Era as a continuation of the New Deal or as separate events. Those who agree that we are in the Sixth Party System generally cannot agree when it began, however - either the Civil Rights Era or the Reagan Era was the beginning of the Sixth party System. Note 3: At this point, the American Civil War comes into play, after the election of President Lincoln. The short version is that the Southern States wanted to keep slaves, and the Northern States wanted to abolish slavery. I am not going to get into this, because the Civil War is a whole post of its own, with ties into current events (Klu Klux Klan, Neo-Nazis, the Criminal Justice System, and the events happening right now in Charlottesville, Virginia). 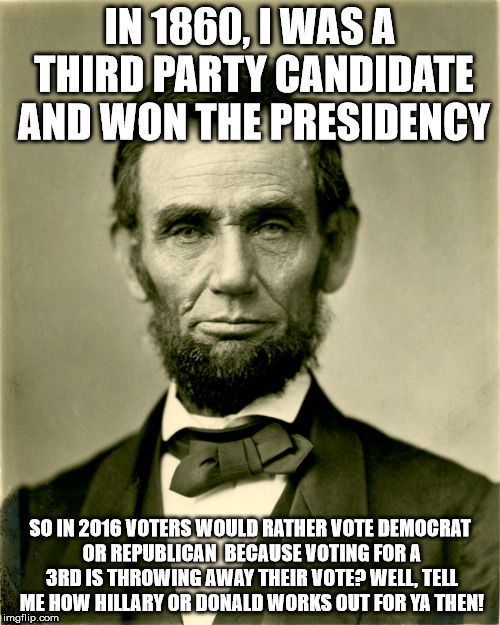 Note 4: During the 2016 election, there had been a meme going around indicating that the Republican Party was a third party, and that Abraham Lincoln was a third party candidate  - this is a fabrication supported by supporters of Gary Johnson of the Libertarian Party . The third parties of the era were the Greenback Party , the Populist Party , and the Prohibition Party , while the main parties were the Democrats and Republicans. 1. “1912 Presidential Election.” The American Presidency Project, www.presidency.ucsb.edu/showelection.php?year=1912. Accessed 12 Aug. 2017. 2. “1972 Presidential Election.” The American Presidency Project, www.presidency.ucsb.edu/showelection.php?year=1972. Accessed 12 Aug. 2017. 3. Anne, Libby. “Abraham Lincoln Was Not a Third Party Candidate.” Love, Joy, Feminism, Patheos, 26 Sept. 2016, www.patheos.com/blogs/lovejoyfeminism/2016/09/abraham-lincoln-was-not-a-third-party-candidate.html. Accessed 13 Aug. 2017. 4. Freidel, Frank, and Hugh Sidey. “Abraham Lincoln.” The White House, The United States Government, 8 Mar. 2017, www.whitehouse.gov/1600/presidents/abrahamlincoln. Accessed 12 Aug. 2017. The Presidential biographies on WhiteHouse.gov are from “The Presidents of the United States of America,” by Frank Freidel and Hugh Sidey. Copyright 2006 by the White House Historical Association. 5. “Greenback Party.” Wikipedia, Wikimedia Foundation, 7 Aug. 2017, en.wikipedia.org/wiki/Greenback_Party. Accessed 13 Aug. 2017. 6. Leip, David. “1912 Presidential General Election Results - Minnesota.” Dave Leip's Atlas of U.S. Presidential Elections, uselectionatlas.org/RESULTS/state.php?year=1912&fips=27&off=0&elect=0&f=0. Accessed 12 Aug. 2017. 7. Leip, David. “1972 Presidential General Election Results - Minnesota.” Dave Leip's Atlas of U.S. Presidential Elections, uselectionatlas.org/RESULTS/state.php?year=1972&f=1&off=0&elect=0&fips=27&submit=Retrieve. Accessed 12 Aug. 2017. 8. Leip, David. “2012 Presidential General Election Results - Minnesota.” Dave Leip's Atlas of U.S. Presidential Elections, uselectionatlas.org/RESULTS/state.php?year=2012&fips=27&off=0&elect=0&f=0. Accessed 12 Aug. 2017. 9. “Minnesota Elections: Dates and Vote Totals.” Election Results - Minnesota Legislative Reference Library, www.leg.state.mn.us/lrl/mngov/electionresults. Accessed 12 Aug. 2017. 10. “MN Election Results.” Office of the Minnesota Secretary of State, electionresults.sos.state.mn.us/ENR/home/1. Accessed 12 Aug. 2017. 11. “Panic of 1893.” Wikipedia, Wikimedia Foundation, 14 Aug. 2017, en.wikipedia.org/wiki/Panic_of_1893. Accessed 16 Aug. 2017. 12. “Party system.” Wikipedia, Wikimedia Foundation, 4 Aug. 2017, en.wikipedia.org/wiki/Party_system. Accessed 12 Aug. 2017. 13. “People's Party (United States).” Wikipedia, Wikimedia Foundation, 1 Aug. 2017, en.wikipedia.org/wiki/People%27s_Party_(United_States). Accessed 13 Aug. 2017. 14. “Presidential and Congressional Reconstruction Plans - AP U.S. History Topic Outlines - Study Notes.” Study Notes, www.apstudynotes.org/us-history/topics/presidential-and-congressional-reconstruction-plans/. Accessed 13 Aug. 2017. 15. “Prohibition Party.” Wikipedia, Wikimedia Foundation, 7 Aug. 2017, en.wikipedia.org/wiki/Prohibition_Party. Accessed 13 Aug. 2017. 16. “Radical Reconstruction.” Ushistory.org, Independence Hall Association, www.ushistory.org/us/35b.asp. Accessed 13 Aug. 2017. 17. “Radical Republicans.” Ohio History Central, Ohio History Connection, www.ohiohistorycentral.org/w/Radical_Republicans. Accessed 13 Aug. 2017. 18. Rouner, Jef. “Dear Libertarians: Stop Saying Abraham Lincoln Was a Third Party Candidate.” Houston Press, 20 Oct. 2016, www.houstonpress.com/arts/dear-libertarians-stop-saying-abraham-lincoln-was-a-third-party-candidate-8713006. Accessed 13 Aug. 2017. 20. “The Civil Rights Bill of 1866.” US House of Representatives: History, Art & Archives, history.house.gov/Historical-Highlights/1851-1900/The-Civil-Rights-Bill-of-1866/. Accessed 13 Aug. 2017. 21. “The Origins of the Republican Party.” Ushistory.org, Independence Hall Association, www.ushistory.org/gop/origins.htm. Accessed 13 Aug. 2017. 22. Wilson, J. “Johnson Super PAC's 'Dead Abe Lincoln' Video Is 2016's Most Viewed Ad.” A Libertarian Future, 15 Sept. 2016, alibertarianfuture.com/big-government/propaganda/johnson-super-pacs-dead-abe-lincoln-video-is-2016s-most-viewed-political-ad/. Accessed 13 Aug. 2017. Newer PostI'm still here - things have just been hectic! Older PostTo Survive, Persons of Color are Taught Differently.